Those are the words our driver blurted out at us from the front seat of the jeep as we made a sharp turn, that appeared to be just centimeters from clipping the rock wall, during our trek up through another less traveled road along the muddy mountainside of Madeira. I first heard of a drink with the same name while working in a bar on Nantucket, not realizing it was actually named after the place it comes from. 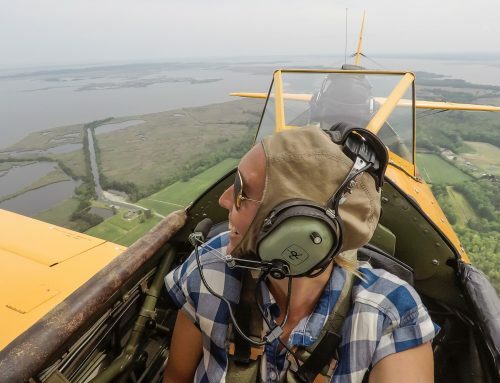 While on the island, I found a slower moving generation of European travelers made up many of the visitors, I’m assuming partly because it’s a direct flight for them whereas from the US you’ve got two stops. 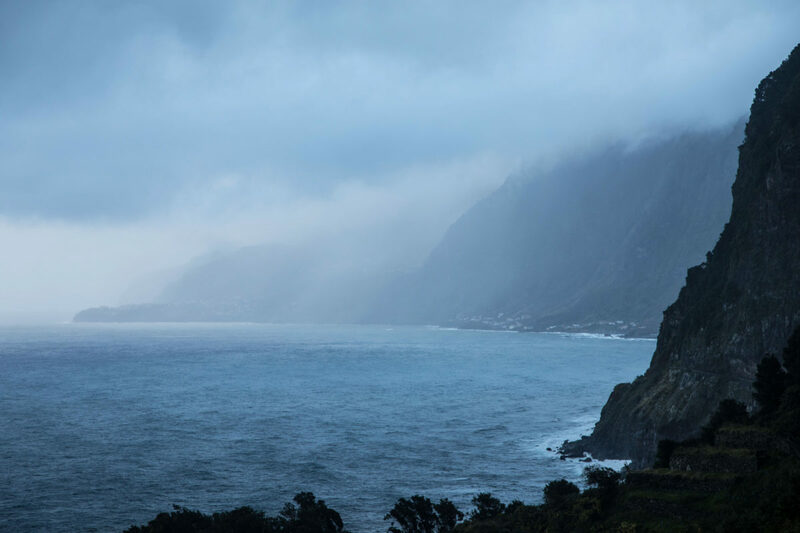 Madeira island wasn’t a destination I had on my list, but I’m so glad we chose to explore it. I think a younger generation will be traveling here soon enough after seeing all the adventure it has to offer. 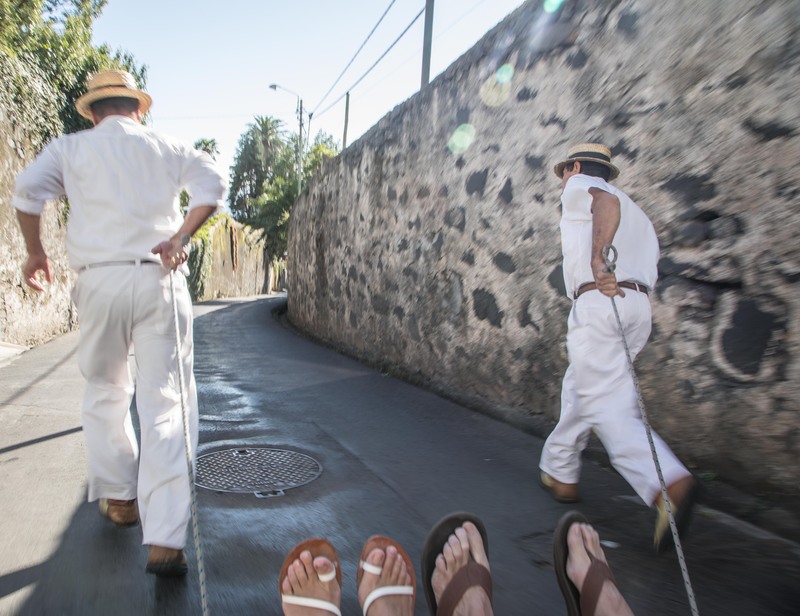 Whether you’re spending a long weekend or an entire week, like we did, on Madeira, there’s plenty to keep you active, entertained, and well fed. 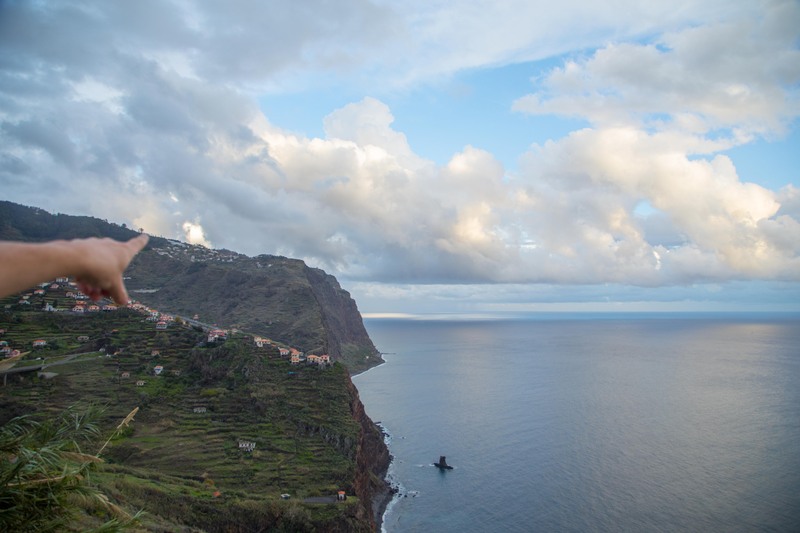 Mostly rugged, and a little refined, here’s a guide to the best of Madeira. If you eat (and drink) local, you’ll do so like a king. I’m always in search of great food when I traveling, but I found it a bit harder to just happen upon in Madeira. The Poncha, made with lemon juice, orange juice, honey, sugar cane rum (the lemon and rum from Madeira) is the traditional drink of Madeira. As our local friend stressed, it’s not traditional unless it’s served fresh. The local way to enjoy this drink is alongside the company of ‘tremocos‘ or lupin seeds you’ll find as a bar snack. Another must try is ‘Bolo Do Caco,’ a traditional Madeiran bread. Round and oozing with garlic butter, it is served alongside many meals. The best way to eat local is to look no further than at what is around you. 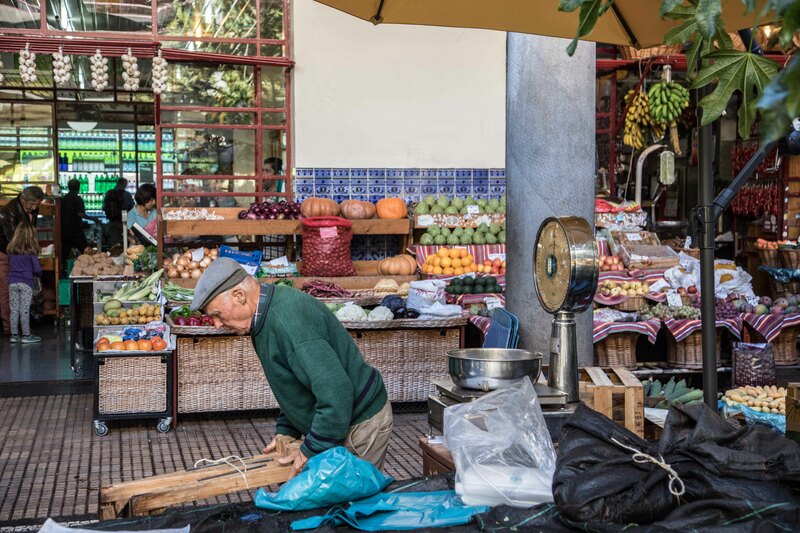 Take a walk through the Mercado dos Lavradores in Funchal and you’ll find fresh passion fruit, cabbage, chestnuts, bananas, and chilis among a wide variety of fruit and vegetables. Walk down below to check out the fresh catch. Most of the produce is from the farms, which in Madeira, are all small sources as the island is so mountainous. Hydrangeas and Citronella also grow on the island. There is no shortage of seafood in Madeira. Scabbard fish, octopus, castanhetas, or small fish, are on most menus but my favorite new mollusk I discovered in Madeira is the limpet. 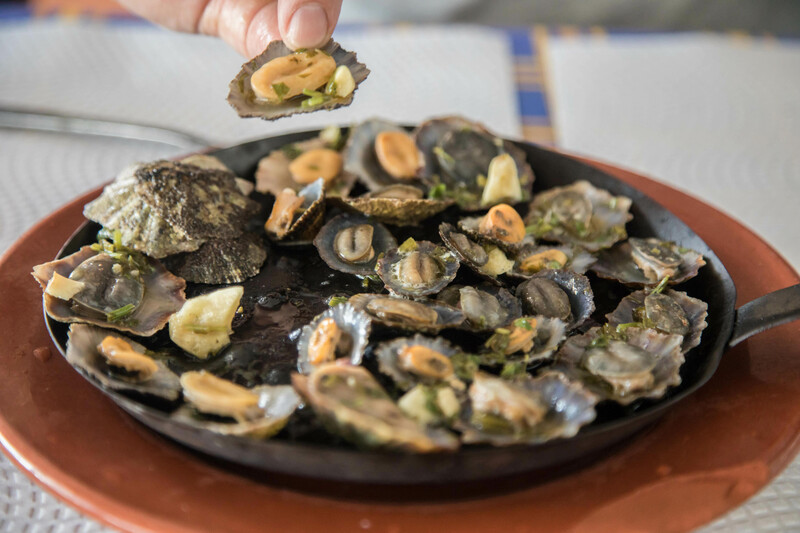 Grilled limpets, or ‘lapas‘ in Portuguese, have been my appetizer order every day for each meal (I even went back for a second round on a few occasions). These mollusks are only a few inches in size and are best described as a cross between a mussel and a clam. They are typically found on rocky shores in clear water and simply grilled with garlic and a squeeze of lemon. 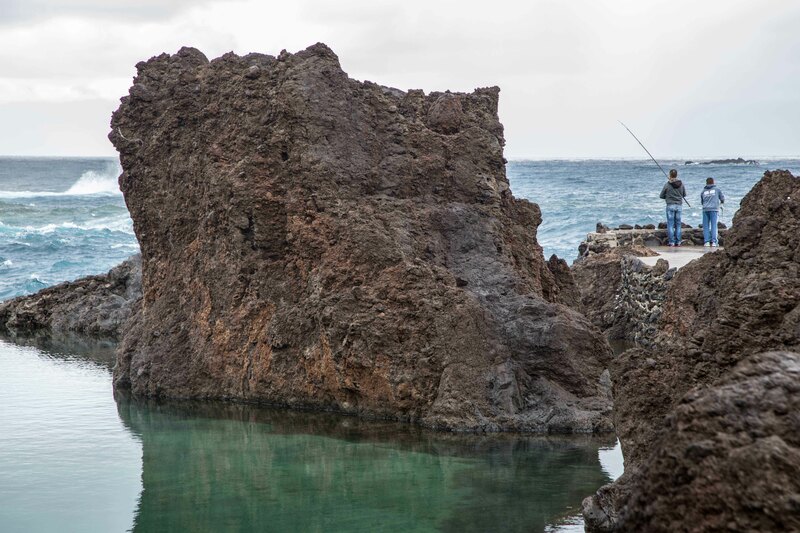 You can try popping them right off the rocks yourself in the small fishing village of Seixal on the north coast. In Funchal, The Vine Hotel is where to grab a cocktail – preferably one with bubbles, since Madeira produces its own soda water (that I’m in love with) – or a glass of wine from the knowledgable staff just before sunset. The rooftop bar has spectacular views of the city. For a formal dinner, dine indoors or alfresco at Tipografia Mediterranean Restaurant. I loved my meal at Tipografia from the starter all the way through to the sweets. They also have a darling little bar/ lounge inside the second building where the hotel is located. 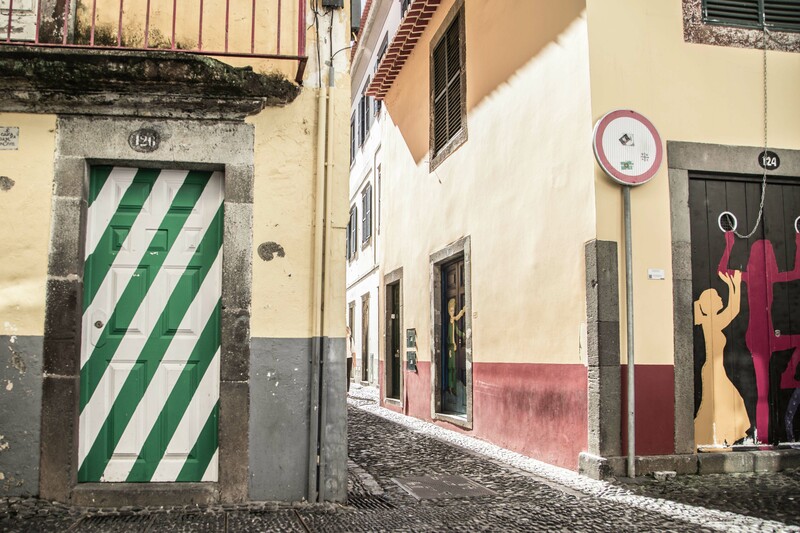 If you’re one of those door-obsessed instagramers, you’re in for a treat in Funchal. There’s even an entire street dedicated to artist painted doors. After walking up a long completely abandoned street I found a little local bistro (tasted more delicious limpets, of course) with the best views. As we made our way back down, I stumbled upon a beautiful little alleyway that led us straight downtown. 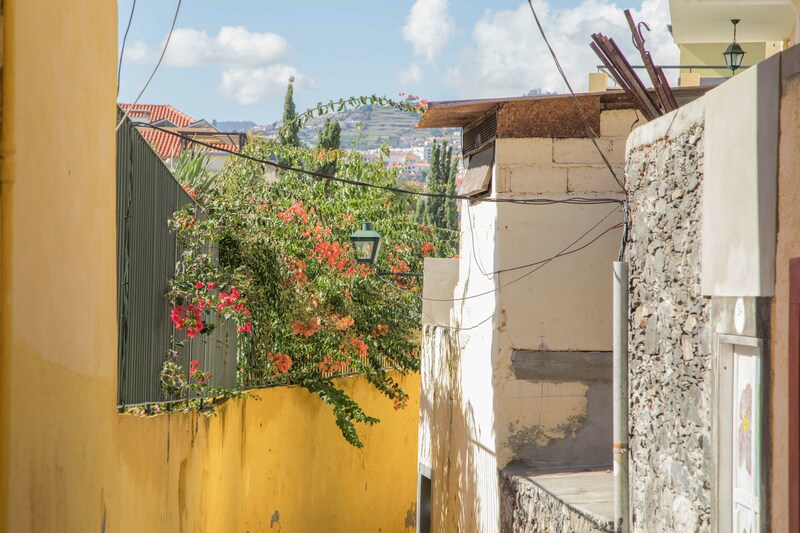 The most magical parts of Madeira were found on walks down stone stacked streets and by ducking down little hidden alleyways such as Travessa do forte. Riding up in the Teleférico do Funchal is far different than other cable cars I’ve hopped in. 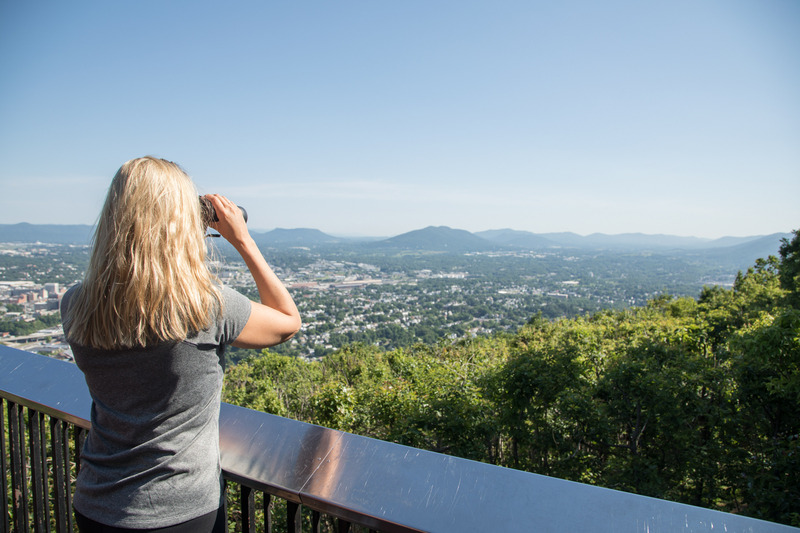 The ride up boasts incredible views, and once at the top you’re greeted with expansive views, the botanical gardens, and a lovely church. However, it was what we did to come back down was the most memorable. Only pay 25 Euro to hop in a Wicker Toboggan for a ‘Sled Ride’ down. 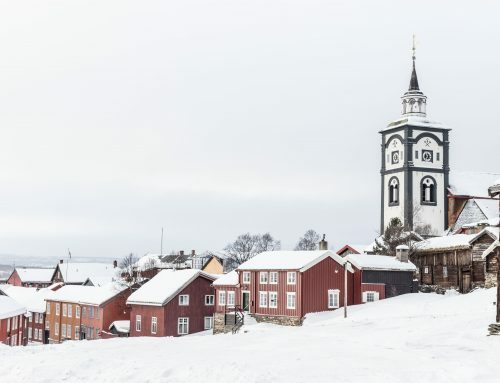 Over a hundred men in all white are gathered at the top chatting amongst themselves or hanging out in the local bar waiting their turn to take you down the hill. Two of these men start you off slowly by walking in front pulling ropes. When you’re at the right position, they use the ropes to whip the sled into full speed while quickly hopping on the back to steer the sled as you go flying down the hill for 2 kilometers (and what makes it even more thrilling? No brakes!). Touristy. Yes. 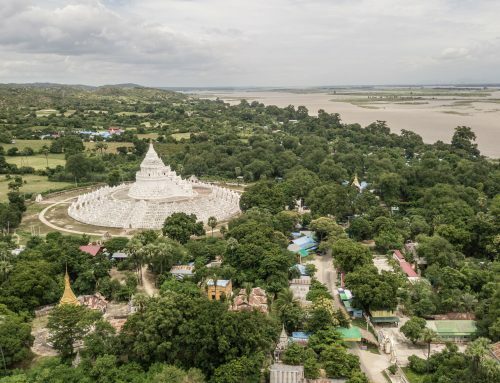 But sometimes to experience the unique aspects of a city or country you have to embrace the “tourism” label with open arms, and trust me when I say that it’s worth every second. While I’m not usually one for group tours, a jeep tour is definitely one I’d recommend on the first day. 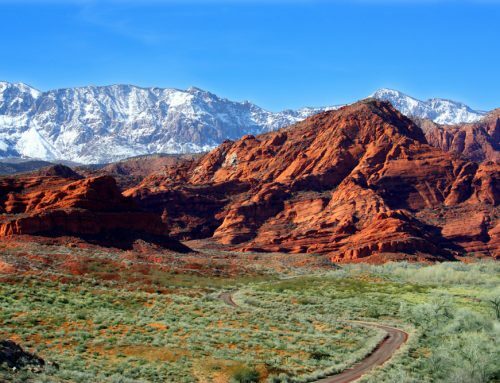 The tour companies have plenty of options of routes, so pick one you don’t think you’ll want to hike. Our guide was fun and knowledgeable, and it was a great way to get acquainted with the landscapes and views of the island. Taking us up otherwise inaccessible roads to the everyday traveler with a rental car, we took sharp curves down the mud covered and gravelless back roads in Pico das Pedras. The smells were pure in this off the beaten path air as we passed through Spanish moss and dense thick forest that looked like a scene from the movie Twilight. 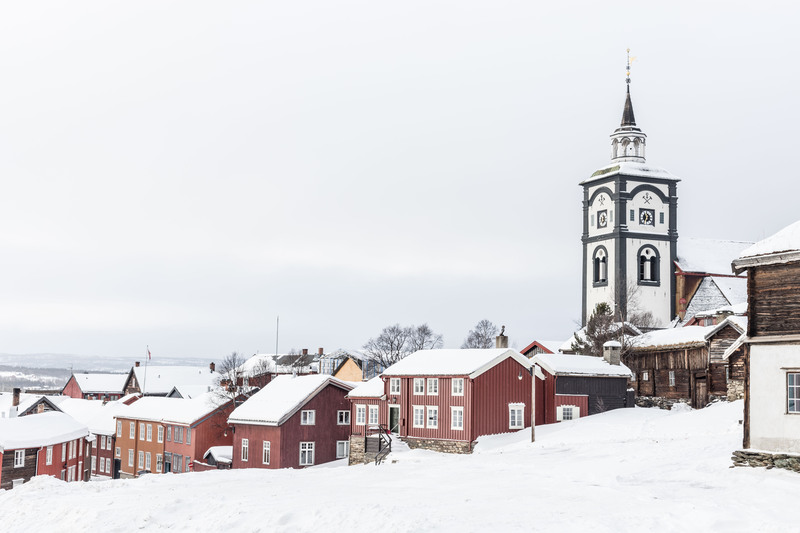 And, best of all, explore little villages along the way. One of my favorite stops for the hillside landscapes for coffee during our jeep tour was through the small village Cruzinhas. When I explore, I love getting a little lost. And what better way to explore the best of Madeira than to rent a car, get out and explore on your own. 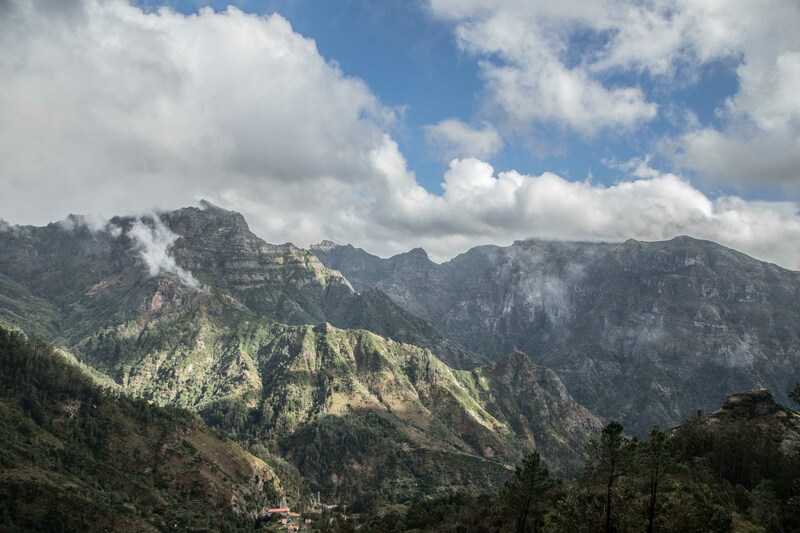 Madeira’s intriguing highway system full of bridges and tunnels cutting through mountainsides make driving through hanging clouds over the steep ravines part of the adventure. Word of caution, if you are exploring one of the smaller towns, just try not to take a wrong turn and end up on a crumbling cliffside. If you’ve ever driven the California’s HWY1, Dominica, or hugged the curves on the Road to Hana, you’ll feel a similar thrilling experience while navigating this island. Though most of the side roads have been closed off due to fallen rock, you can still quickly pull off on the return trip to snap pictures like these. From this view, all signs point to Funchal. 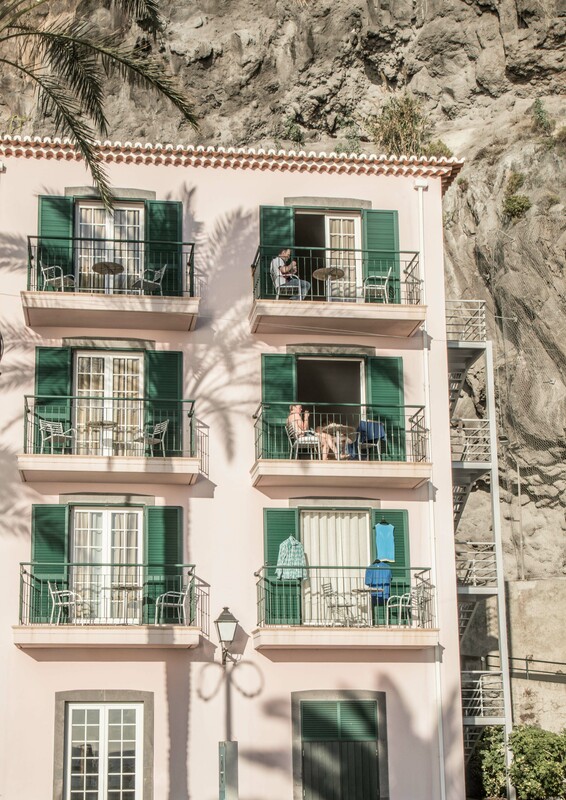 The little coves, side streets, and tiny mountainside stays. After a similar experience to what you’d expect on California’s Highway 1, this was definitely worth the drive. The road twisted through tunnel after tunnel through the mountains and along the sea. In the Northwestern corner of the island you’ll find jaw dropping ‘natural’ swimming pools carved by man just adjacent to the sea. The waves crash in like fireworks at high tide and slowly filter back out through the volcanic rock formations. You may also spot a few local fisherman like we did. 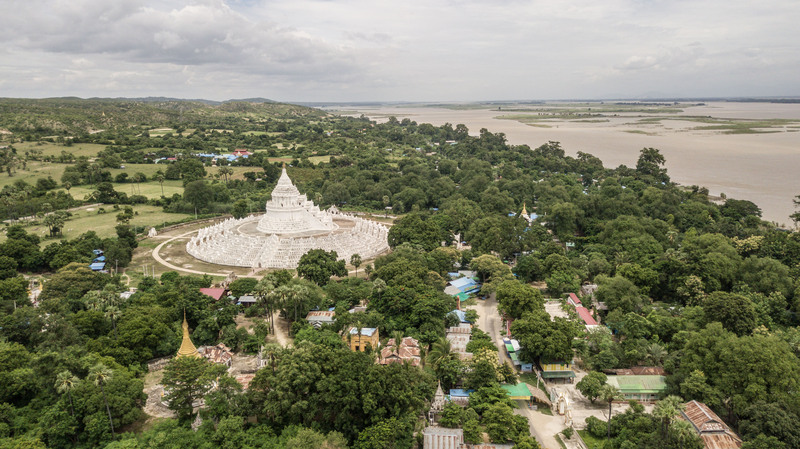 Though a popular spot for visitors, it’s a must-see. Machico is the largest valley in Madeira where the early settlement happened. After eating the most delicious array of seafood at Muralha’s, I walked the wall in Canical as we waited for sunset. It was the most calming experience to listen the water pull its way through the smaller rocks back into the sea, a sound all too familiar to me living on Nantucket. 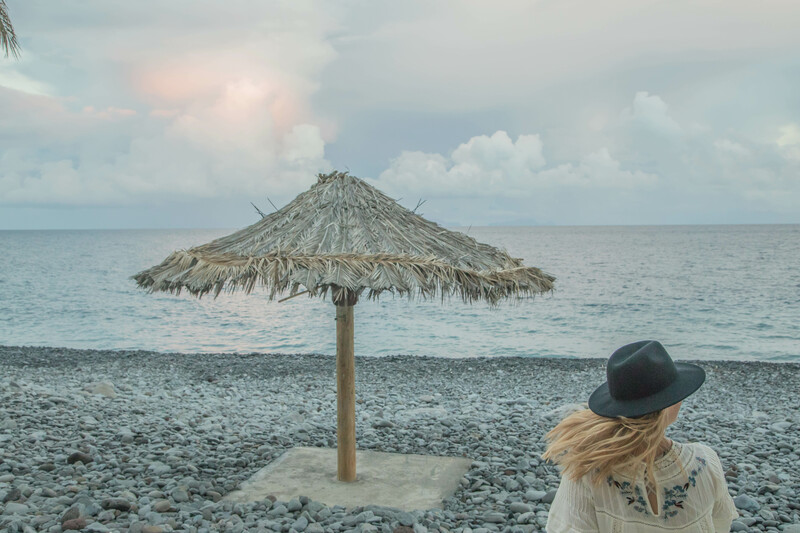 If you’re searching for a sandy-beached island, you won’t find a natural one on Madeira — it’s all beautiful, rocky shoreline here. You’ll have to head out to Porto Santo via ferry or short flight to feel the sand in between your toes. You’ll find a few traditional, thatched houses here. 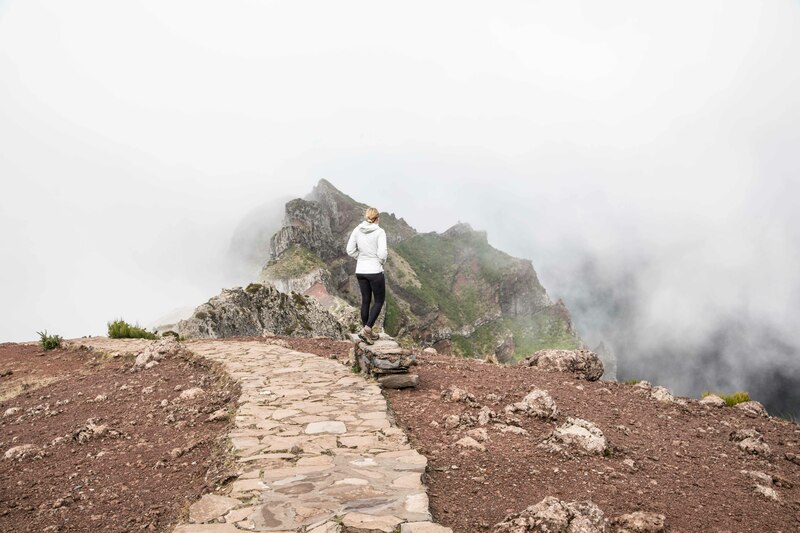 There are endless options for trekking in Madeira, so you can personalize your hike by choosing trails that fit your skill and exertion level. A favorite by many is the Vereda da Ponta de São Lourenço on the eastern tip of the island. 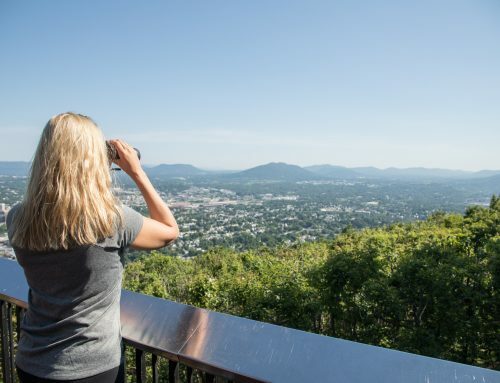 If you’re planning on taking a camera-roll worth of photographs, allow about 4 hours to finish the hike. Bring a bathing suit. There’s a place to hop in the water just after you make it to the top before the return trip. Pico do Arieiro, the third highest peak in Madeira, sits at the beginning of another trail. Just below the lingering fog, you’ll find a stunning start to the hike. Be prepared to layer on the clothes, it’s much cooler up in the peaks. The howling gusts of wind can be bone chilling., but you’ll be in for so many worthwhile treats – waterfalls included. The Laurel Forest is also full of trails. The path has some of the most beautiful trees and peek through views of the valleys down below. 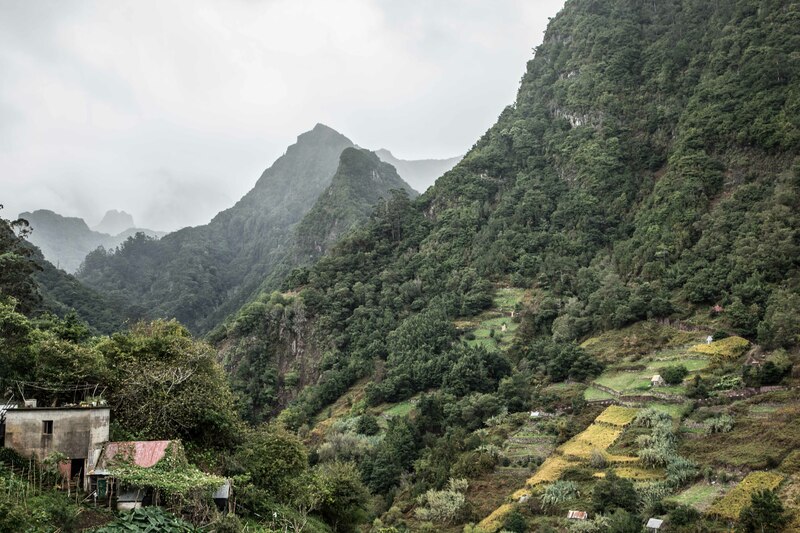 Levada’s are the aqueducts or byways in which people of Madeira get their water. And you shouldn’t leave the island without walking one of them. Walking along Caminho do Pinaculo a Folhadal was a thrilling experience. There were moments where I couldn’t see six feet in front of my feet because of passing fog and low hanging clouds, and other moments, just minutes later, where the clouds disappeared and the sky opened up like the heavens. The dramatic drop-off on the left and a 5 foot drop on the right made for a walk that was a little unnerving at times, not to mention the fact that the walk is on a concrete wall that, for most of the journey, is not much more than 2 and a half feet wide. Of all the hikes and walks I’ve done, this is one of the most unique in the world. 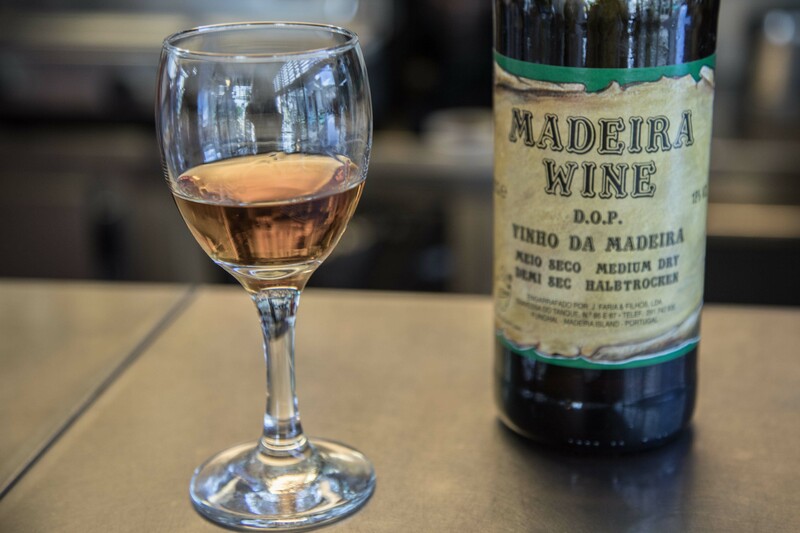 It may be obvious, but make sure you don’t leave Madeira without trying some of this delicious wine. There are shops in town where you can taste, but even better to see the vines as you wind your way up to Herdade do Esparto Branco where not many speak English. The Airport was renamed in 2016 after famous local soccer player Cristiano Ronaldo. The local Laurel tree is used to skewer the meat served at some local restaurants. There are only manmade beaches on Madeira’s main island. Take a 1 hour flight or two and a half hour boat ride to Porto Santo for the real sand. 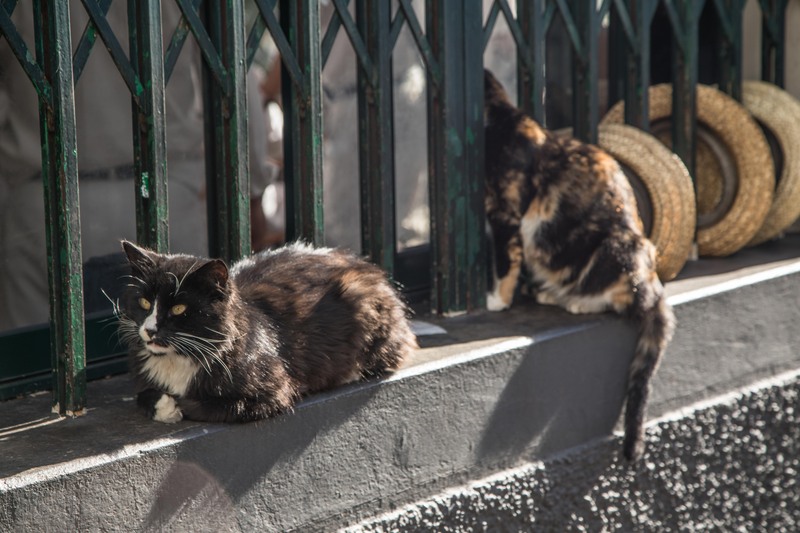 US East Coast-ers pack your bags: you can get to Madeira from Boston or NYC with just a hop skip and jump, with a quick layover in the Azores (another great place in Portugal to explore). Keep in mind when booking that the star-rating system in Europe isn’t the same as the five-star system in the US. One option that I recommend in town is Castanheiro Boutique Hotel. I was able to take a tour of this lovely boutique hotel, right in the heart of the historical district. 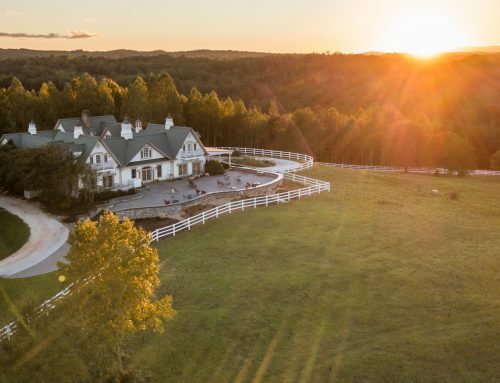 For old school luxury, I always love a Belmond property. Belmond Reid’s Palace luxury hotel in Madeira will add some timeless charm to your stay, complete with a seaside view. Weather is warm for the most part year round at the lower elevations, but up high you’ll want to bring warm things to wear. Like many islands the weather is constantly changing, especially during rainy season so bring a rain jacket as well. Our full packing list here. When renting a car, instead of renting a GPS device, rent a wifi device and use your phone with it to navigate around the island. They have GlocalMe, which worked everywhere we drove, available at AVIS and it’s saves you a few dollars a day. Pack a lunch if you’re hiking. There are places we went all had random picnic benches along the way which would have made for the best lunch spots. Be careful what plantlife you touch – there’s some blinding beauty in Madeira… and I’m talking about more than the landscapes. I was told by our local friend there’s a plant (as he pointed out) that can actually make you go blind after touching it. What would be at the top of your ‘Best of Maderia’ list if you explored this island? Let us know below! JOIN US ON ADVENTURES – SIGN UP FOR OUR NEWSLETTER HERE! I love how you completely toured Madeira, leaving nothing out (it seems). The food sounds amazing and the overall vibe makes me want to visit! I had so much fun winding my way around the island! So many natural wonders on this island! Just full of hiking and the great outdoors. So so beautiful!! Totally reminds me of the Amalfi Coast with the crazy driving! And I so relate to the part about finding the best spots while roaming – I always find that to be true!! People spend so much time looking for photo spots from big landmarks and such but hidden gems are always the best. Really great post – adding it to my list! This looks like a fantastic trip! Your food recommendations are in my mental notebook…anything “seafood” is a big hit with me! Good to know about the plants, I’m always touching them and looking for something unique to photograph. Obviously I love your photos! I actually have never heard of this place, it looks like a place I would really enjoy especially with all the great seafood. 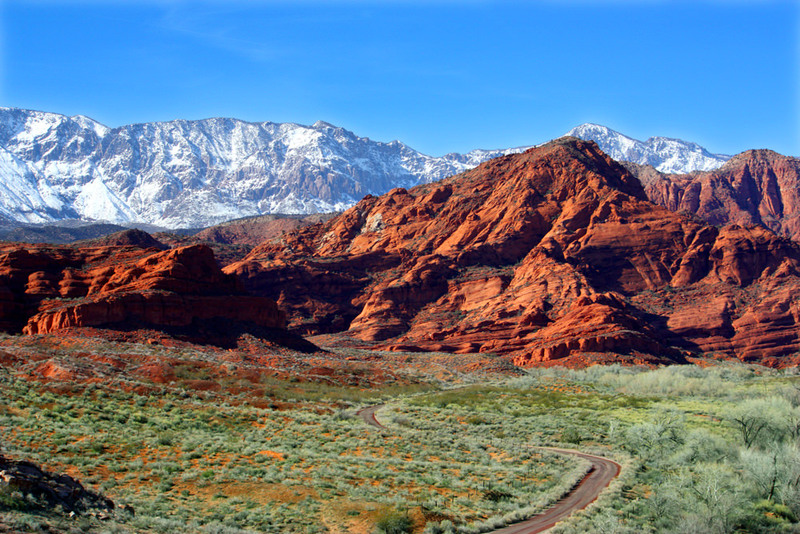 The hike seems like a great one too! Thanks Christine! 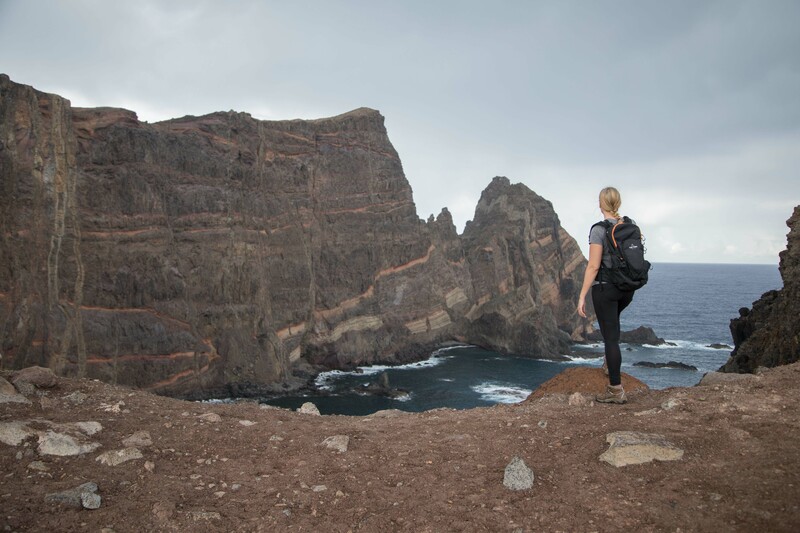 Madeira would be a great addition to any travelers bucket list adventures. The island is so photogenic! That local Madeira poncho was delicious. Make are you try it fresh when you get a chance. I hope you’ll explore the island soon!